Our first ever premiership game on the Sunshine Coast has proved fruitful. But things didn't go our way when Souths found themselves 12 points down soon after halftime. We showed good character to rally and on the back of opposition errors were able to turn the game. Now off to our annual Good Friday clash. Still 10 more wins to qualify for the semis. What a game by Cody Walker. He put in a first class performance once again verses the Warriors scoring not 1, not 2, not 3 but 4 tries. His ability to find gaps against a tired Warriors outfit paved the way for a come from behind win. 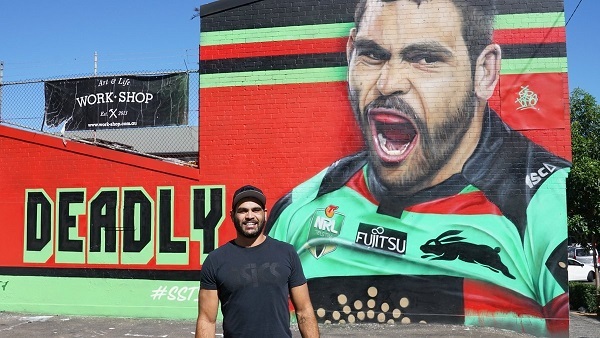 This week we saw the retirement of a champion in Greg Inglis. He was a key figure in our road to 21 and by the end of his great career had achieved everything in the game. He will go down as one of the Souths greats and all Souths fans are honoured to have seen him play in the cardinal and myrtle. Good luck in his next stage of life, he has deserved it and us Souths fans will miss him. Jack Johns son of Matty is starting to make a name for himself as a wide running player. On the weekend he broke through the line from a scrum to seal the 4th win for our reserve grade team. I am looking forward to seeing him develop and could end up being a handy outside back. Another Allan is becoming a regular try scoing feature of the U20s. Kane got a taste of U20s last year, but looks like he has finally pushed his way into the team. His a fast a renouned support player and has a habit of being in the right place at the right time to score critical tries. Looking forward to seeing him progress. What can you say about Suaalii that hasn't been said. In Souths biggest junior game for a number of years this kid stood above the pack and scored a spectular 4 tries to put Souths U16s one win away from the grand final. It won't be long before he is pushing for a grade spot. When the 7 Tackle set after a kick goes was introduced, it was the curb a trend of kicking balls dead from long range to reduce the impact of the kick return from fullbacks who would use it as a opportunity to attack. However the implementation of the rule effected all 20m taps being 7 tackles. So short range attacking grubber kicks and knock-ons and field goal attempts all result in 7 tackle sets. We need to go back to the basics of the rule and adjust it as follows. A 7 tackle set should only be awarded when a long range kick ie outside the 40m mark goes dead in goal. Attempting a proper field goals, eg a drop kick directed towards the uprights, Knock-ons in goal, and attacking plays should result in a normal 6 tackle set. Statistically it was another typical hot weather game. Completion improved to 77% from 73% last week. Errors dropped to 7 from 12 last week. We gave away 6 penalties again this week. Souths Effective 1st tackle improved and is still in a good level of 26.9m from 28.5m last week. Our missed tackles were at a poor level of 39 missed tackles from 37 last week. Opposition offloads dropped to 15 from 8 last week. Looking at our left side defence - Graham-Turner-Walker-Sutton/Lowe (2-1-1-0) was improved to 4 missed tackles from 12 last week. On the right side CAllan-Gagai-Reynolds-SBurgess/Lowe (1-4-4-2) was dropped to 11 from 10 missed tackles last week. Ruck defence TBurgess/GBurgess-Cook-Tatola/Nicholls-Murray/SBurgess (9-3-4-5) was dropped to 21 from 14 missed tackles last week. Our go forward dropped to 1651m from 1793m last week. Tom Burgess, Murray and Knight made 10+m per run. Cook, Tom Burgess, Tatola, Murray, Sutton, Sam Burgess, Lowe, Walker, Gagai, Johnston and Graham making 100+m in the match. Defensively Cook was our best in the tackling raking up 41 tackles. Sutton and Lowe didn't miss a tackle.